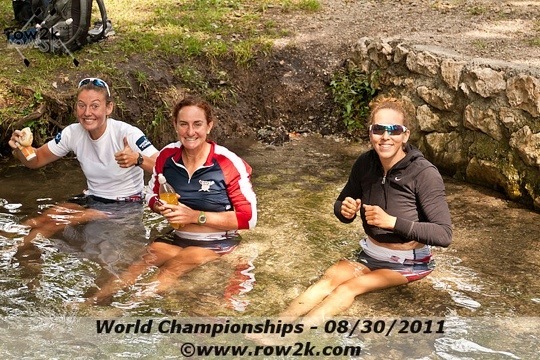 It’s been an exciting couple of days for the W4X. We had an ok start to racing on Sunday coming second to our friends in the German quad in our heat. That race meant a trip to the Reps for us yesterday. The Reps aren’t always such a bad thing–especially for a crew like ours that doesn’t have a lot of racing experience together. This year, however, the Reps weren’t just a battleground for a place in the Final, because a place in the Final isn’t just a place in the Final this year. This year, Finalists are also Olympic Qualifiers, which has a significant impact on the way crews approach progression. For the W4X, only the top 7 quads from this year’s World Championships have guaranteed entries for the Games next year. Missing one of the six spots in the A Final adds a lot of pressure for B Final crews who want to have an opportunity to compete in London. For yesterday’s race, it was a fine balance between acknowledging that–yes, Olympic Qualification was on the line–but also not letting a fear of not qualifying define the way we raced. For a younger crew with limited international experience, I think we handled the emotion of the situation well. If you missed yesterday’s results, we had one of the closer finishes of the day with China and GB. The entire race was very tight, and a lot of fun to execute. We finished just .12 seconds ahead of China, and .87 ahead of GB to win the Rep and qualify for the A Final. With the conditions we had on the course yesterday, I realize that it just as easily could have gone the other way for us. So full credit to the Chinese and British crews for some very tough racing. That is what we’re here to do–making the Final shouldn’t be easy. So the next step for us: recovery. That means resting and taking care of our bodies in order to be sharp and ready for the Final on Thursday. One of the many things this entails is the cold plunge. In Bled, there is a small but very cold brook that runs next to the path into the lake. The good news: the water is clean, clear, cold and great for recovery. The bad news: we are prime targets for public ridicule when everyone at the racecourse walks by and sees us shivering and smiling awkwardly out at them (what else can you do when you’re sitting in a stream eating a sandwich?). But sometimes bad news is good news, since we’ve also had some of the curiosity of passersby turn into conversation, photo ops, and LIST encounters. This morning we had extra morale boost with a whistle from some French heavies and a very friendly greeting from Marcus Bateman (2010 #15) and Matt Wells [www.redexpress2012.com]. Unfortunately for them, I was awake and alert when I got back to the hotel just in time to ride the elevator up with the Australian Men’s Eight including Bryn Coudraye (2010 #2) and Matt Ryan (2009 #10). They were all very sweet and each individually wished me good luck for my race tomorrow as they got out of elevator. What gentlemen! I was just telling Natalie last night that this is the first time I’ve considered expanding the List to 30. Off for another row, then laying low until the Final tomorrow. I second that the list should be expanded to 30. Believe me, it is very, VERY tempting! Excellent racing – well done Megan and co; fingers crossed for some great stuff in the final. There’s joy in Conibear Shellhouse today. You and Adrienne and your teammates did a spectacular job. Way to go!